Students' Model United Nations is an annual conference organized in a form of academic simulation of the United Nations and its councils. SMUN is organized by Students' Club of Political Science Faculty at the University of Banja Luka. 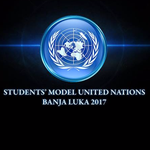 This year edition of SMUN will simulate the work of Human Rights Council and Security Council and will take place at the University of Banja Luka and National Assembly of Republic of Srpska, in October 18-22, 2017. To ensure a true diplomatic experience, SMUN also consists of study visits to legislative and executive bodies of Republic of Srpska, round tables, social events and many more. Experience diplomacy and get motivated for active participation in modern politics by applying for SMUN 2017. We are looking forward to meeting you in October!